Pretty Neat book – Review and GIVEAWAY! When I was offered the chance to review a new book about getting yourself organized in a practical way, I jumped at it! 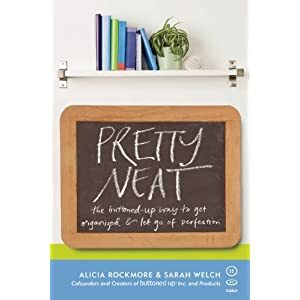 Pretty Neat – the buttoned-up way to get organized & let go of perfection is a new book from authors Alicia Rockmore and Sarah Welch. You might recognize Alicia and Sarah as the women behind Buttoned Up organizational products, too. This book was exactly what I needed to read! The first part of the book discusses the ideas that many women have about organization. Many of us, whether we admit it or not, believe that our homes need to be perfect and pristine. That idea really isn’t very practical when we are living in our houses, especially when there are children living there, too! Alicia and Sarah offer anecdotes, quizzes, and conversations with women who have battled the feelings of perfection – and won. Most of all, they offer practical advice to helping you overcome those feelings and then give you the tools to move forward. The chapter I’m struggling with right now deals with clearing out the clutter at home. This is a HUGE problem at our house. For the first time, though, I feel like I can tackle it successfully by following The Four R’s that Alicia and Sarah have put forth as a cure for clutter – Routines, Rules, Regards, and Review. I’m going to implement this at our house and I hope you’ll check back to see how we’re progressing! Would you like to join me in the adventure to let go of your ideas of perfection? Great! BUY IT: You can buy a copy of Pretty Neat for $14.95 from the Buttoned Up website here. They also have a bunch of great organizational products, so take a minute to check those out, too. I’m a big list-maker and many of their list pads are on my wishlist! One reader can win their own copy of Pretty Neat AND be entered to win a $200 gift card (same as cash) and a selection of Buttoned Up organizational products (ARV $50)!! To enter, leave a comment on this post sharing the area of your home/life that has become a source of stress for you. If you’ve been successful in changing it in any way, please share your ideas, too! This giveaway will end on Sunday, March 20th at 10:59 Central time. The winner will be notified by email, so please make sure to include a valid email address with your comment. Winner will have 24 hours to reply back to me and claim their prize, or a new winner will be chosen. Good luck! Disclosure: I was provided with a copy of Pretty Neat to review. I was not required to give the book a positive review and the opinions above are my own.